The Sacramento River is California’s largest River by discharge with an area of 27,000 sq miles. Its main headwaters stem from Mt Shasta and then run 72 miles through small cities to its first largest city on the river’s course, Redding. 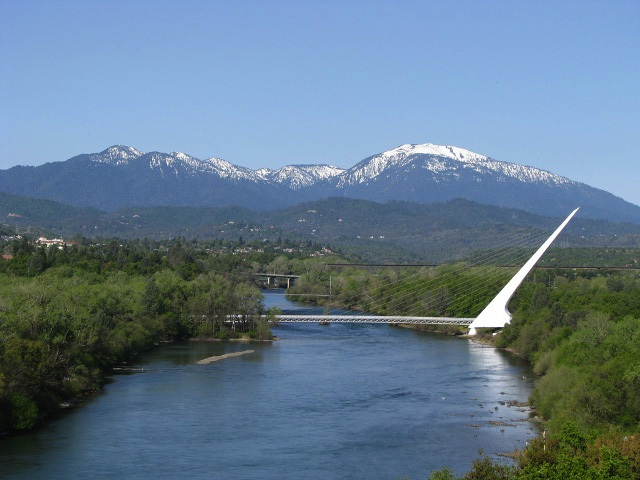 Redding is also its second largest city on the river’s entire course. The Pit River, located just miles from Summit Retreat is the Sacramento River’s most northerly tributary. Today, if you take a walk along the Sacramento River trail in Redding, you are guaranteed to see either a band of wild explorers rafting down its mild rapids or a number of fly fishermen casting their lines. The Sacramento River has served as an important transportation route since its first inhabitants settled in the river valley about 12,000 years ago. Due to its ample water flow, fertile soil and mild climate, the Sacramento River and its valley was an ideal environment for its earliest Native American inhabitants. The late 19th century on through the 20th century brought an economic boom for California and led to rapid expansion. This expansion and increased demand for water gave way to the California State Water Project which led to the construction of Shasta Dam in the late 1930’s. Today, at least half of the cities and towns in California’s water supply come from the Sacramento River. Though pollution is a given concern and an ongoing battle, the Sacramento River is considered to have relatively clean water given its size.